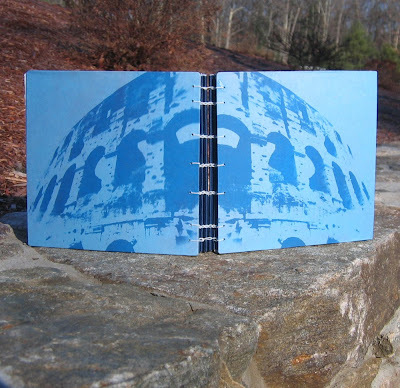 Kristi from OliveArt covered the boards of her coptic bound swap book with Sunprints of the Colosseum in Rome. The photos were taken using a Holga camera, transferred into Kodaliths, then printed using the natural light onto Sunprint Paper. At 6.5"square, it will make a great for travel journal. I wonder if the grateful recipient has a trip to Italy in their future? 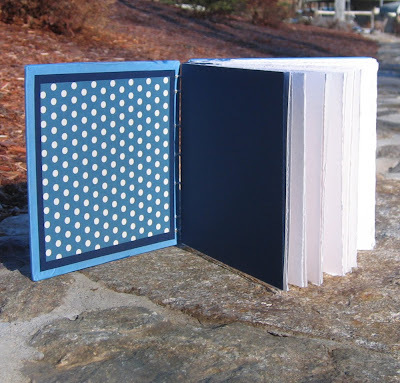 It's filled with 72 pages of white drawing paper and has signature covers made from blue paper to lend both style and durability. Find Kristi's books and other creative handmades in her shop: www.oliveart.etsy.com. I love the cover image! I love sunprints. This is a beautiful example, and it looks good on the cover! SURE! I can explain sunprints! Maybe ill get adventurous and make a flip video of the process!